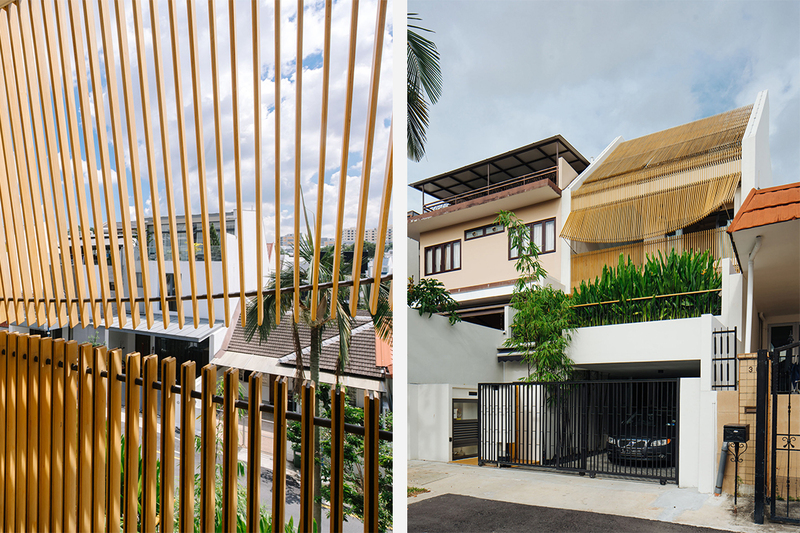 A brise soleil design on the facade of the Cardiff Grove House surprises as it opens, reflecting the joyous approach of MAKK Architects toward domestic design. 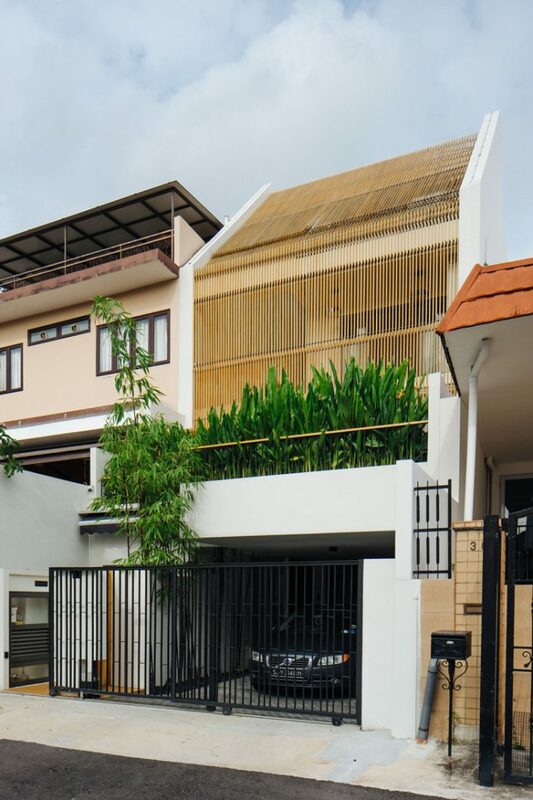 The screen is a popular element for houses in the tropics, applied for its efficiency in mitigating harsh sunlight and views within high-density neighbourhoods without compromising on natural ventilation. 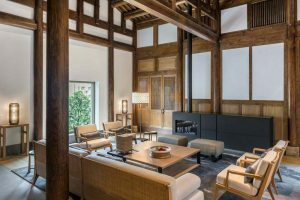 Its functionality is well documented in traditional vernacular architecture and continues to offer myriad design potential to this day. 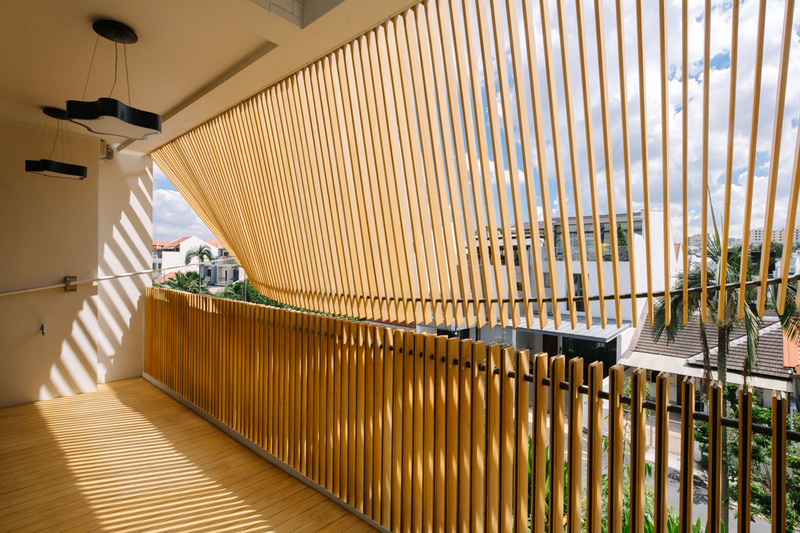 A commonly used, straightforward design is that of vertical timber strips with varying gap widths. While timeless, it does not offer much excitement. 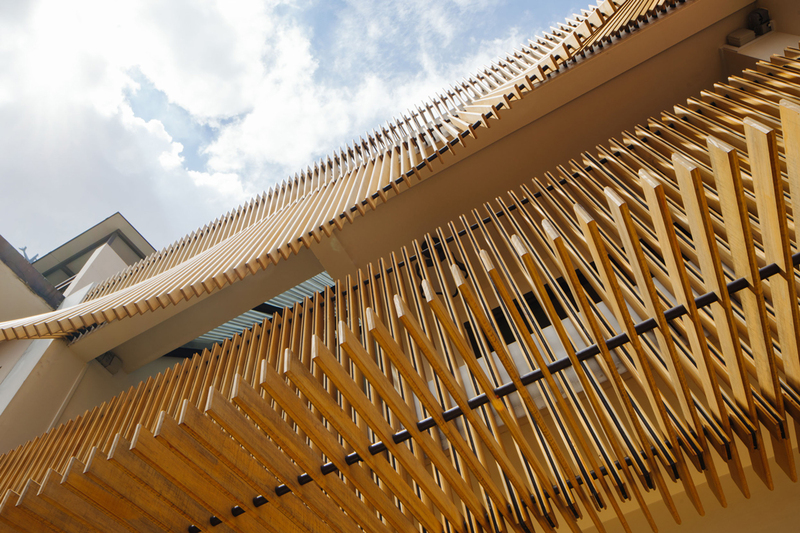 Thus, MAKK Architects’ brilliantly designed screen on the facade of the Cardiff Grove House in Singapore is a breath of fresh air. It is innovative in both appearance and operation, providing animation to the simple act of opening a screen. 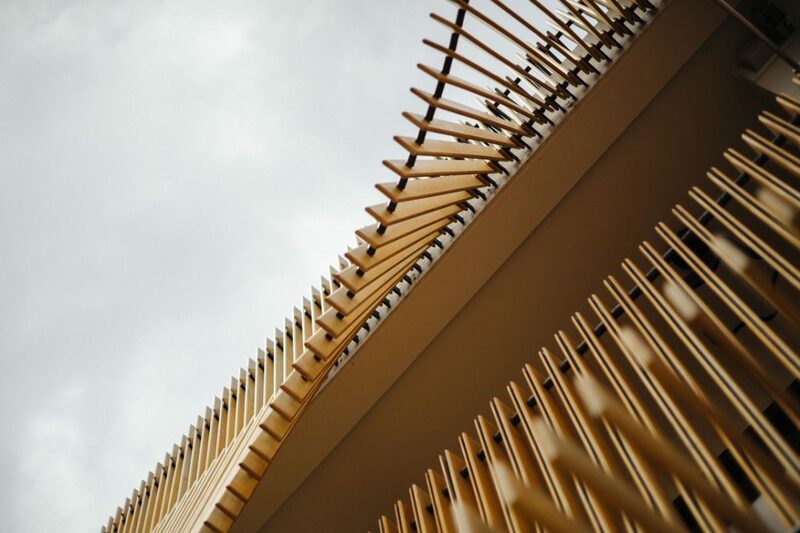 When down, it wraps the front face of the home in an unassuming layer – like a timber curtain – from the tip of the roof to the top of the car porch roof garden. When lifted, this static nature transforms with fluid motion. The raised sides of the screen create a concave profile. It is as if the timber strips are dancing; the lid of the house delights with a tectonic wink. Much thought was applied to ensure smooth usage as well as a clean aesthetic for the screen. Lightweight Accoya timber was used to allow easy lifting of the screen. The weight of the timber strips, steel and cable elements needed to be calculated and calibrated to allow the mechanised arm to lift both sides while maintaining the screen’s fluid look. While the screen is the highlight on the exterior, the design of the staircases was paid special attention inside. 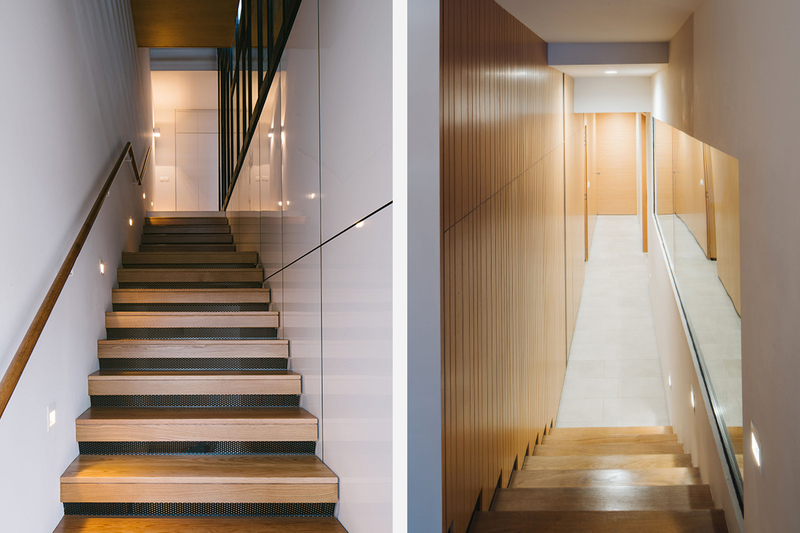 The stairs leading from the entry level down to the basement have powder-coated perforated risers to allow light to pass through from the upper level, while ensuring the safety of the owners’ infant. 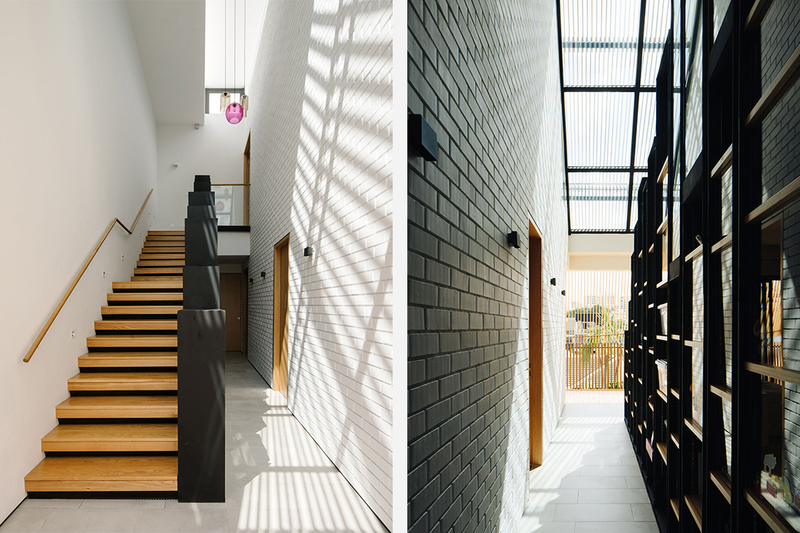 From the second storey to the attic, another staircase functions as a library with integrated shelving – the top of which doubles as balustrades with an interesting height play. The design of the Cardiff Grove House highlights how homes should not just be designed for functionality, but should also delightful. 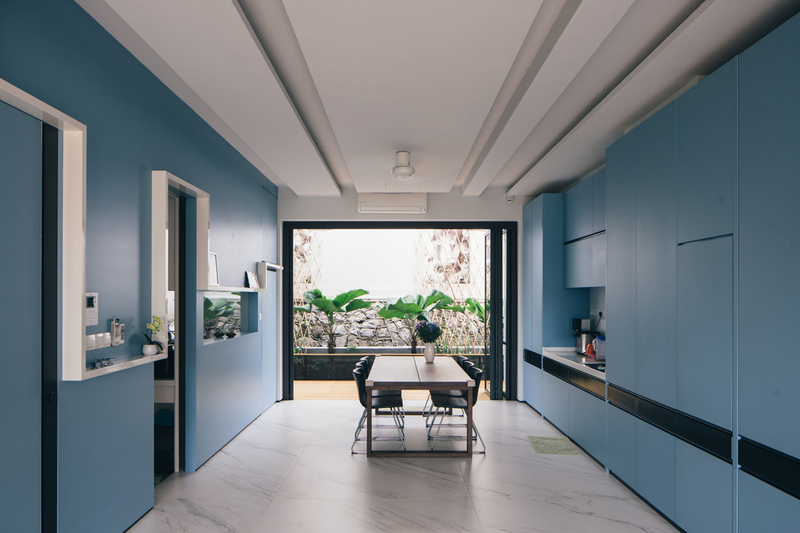 MAKK Architects’ oeuvre, featuring great diversity in approach to house design, makes every project individual. Photography by Studio Periphery | Khoo Guojie. 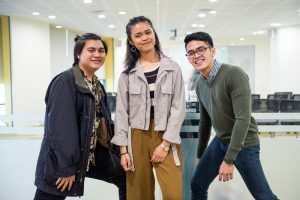 Indesign Media Is Heading To Salone del Mobile 2019 – Are You? 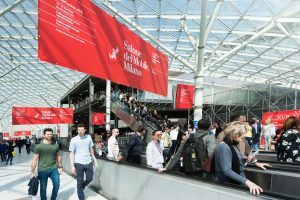 The 58th edition of the Salone del Mobile.Milano is less than one month away; we are packing our bags and finalising our schedules – will you be there? 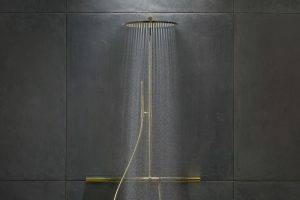 Designed by Phoenix Design, the award-winning Axor ShowerPipe 800 is am elegantly understated shower system that both visually appealing and environmentally friendly.